Ladies, gentlemen, welcome to the future. The ŠKODA company has just entered a new era with the VISION E concept, its first electric model. Have a look at what the future has to offer. There’s no longer any doubt that electric cars will play a larger role in our lives with each coming year. Cities in Germany, Britain, Italy, Sweden, Norway and other countries are gradually restricting the entrance of cars with internal combustion engines. Planned emission limits have been set in Europe for the next decade in such a way that many conventional methods will no longer be able to satisfy them. The only way to achieve compliance will be with the widespread use of electric vehicles. But there’s no need to worry – electric cars certainly have something to offer, and not just low emissions. Electric vehicles aren’t some extravagant accessory or a necessary evil for meeting obligations; they’re a fully legitimate extension of the ŠKODA series. Over the next eight years, ŠKODA will present its hybrid drive systems as well as four fully-electric models that will make up a quarter to a third of all sales. We’re approaching their design just as carefully and thoughtfully as we do any other model. What’s more, the electrical design has many practical advantages over conventional combustion engines. Comfort. A completely flat floor space and smaller demands for the drive mechanism allow for innovative ways of working with the interior space. A longer wheelbase means more room for passengers, the seats can be higher for easier boarding, and the ride is more comfortable. Spaciousness. ŠKODA is approaching the car’s interior democratically, not focusing solely on the driver. All passengers are equal and can benefit from the exceptional spaciousness of electric vehicles. This also lets us upgrade the versatility of the interior to a new level. Stability. The battery beneath the floor, exemplary aerodynamics, and short overhangs – all this provides for more stability and better handling for the upcoming electric vehicles. Driving an electric car can truly be an enjoyable and entertaining experience. All these elements come together in the newly unveiled concept of the VISION E. This will become the model for the first ŠKODA electric vehicle that will be presented to the world in three years. The objective is to create a car that will fit into the current series not only for its design, but especially for its features. It will be practical and suitable for everyday use, thanks to its driving range of up to 500 km and a network of hundreds of quick-charging stations across Europe that the Volkswagen Group is now helping to build. It will be affordable, visually attractive, and a pleasure to drive, and it will offer excellent connectivity. And like every ŠKODA, it will naturally provide plenty of space for passengers and luggage. 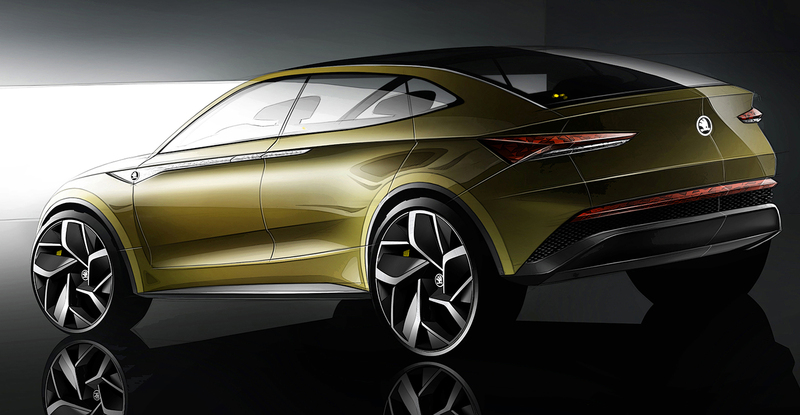 Simply put, it will be a ŠKODA first and an electric vehicle second. HOW WILL ŠKODA VEHICLES SURPRISE US IN THE NEAR FUTURE? The new generation of driving and parking assistants will be the penultimate step towards fully autonomous driving. The car will be able to find a parking place by itself and park in it, move along in a traffic column, or drive itself down the highway. You’ll be able to control your car not only using a smart phone or digital key, but even with your voice. Handling it is then even nicer with tweaks such as the head-up display or the augmented reality for seeing the outside world. The car will download important software updates by itself and schedule its own service. There will also be an on-line shop with services and accessories directly onboard the vehicle. Thanks to an Internet connection, you’ll no longer be dependent on your own MP3 or what they’re playing on the radio. You can mix your entertainment exactly as you wish.